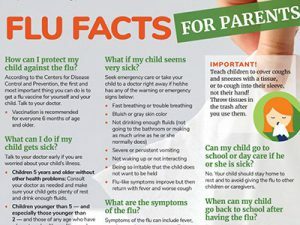 To help you and your family navigate this record-breaking flu season, we are sharing an easy-reference Facts Sheet. The flu — also known as influenza — is a contagious illness that affects the nose, throat, lungs and other parts of the body and can spread quickly from one person to another, according to the New York State Department of Health (DOH). It can cause mild to severe illness and be fatal, especially for those age 65 and older. Across the United States, the flu causes about 12,000 to 56,000 deaths. About 90 percent of these deaths occur in people 65 years or older. This season, there has been one influenza-associated pediatric death reported to the New York State DOH.